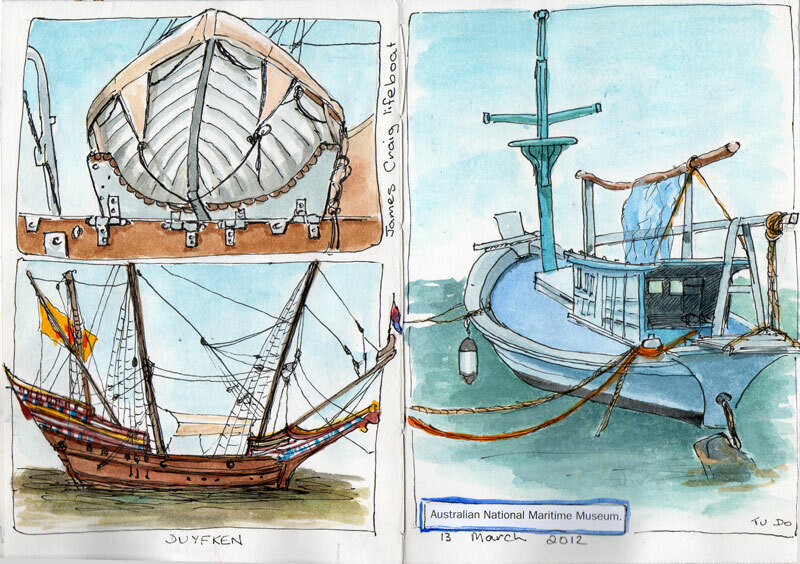 I had to go back to the Maritime Museum last week again, because the Duyfken is leaving Sydney and going to WA for 10 years. She is such a beautiful little ship (a replica) and I've drawn her a few times. We went on board and there were wonderful things to see there too - wooden kitchenware, I guess you'd call it. Cannons. I took some photos with my phone and I have material there for a lot of still life paintings. We then went on board the sailing ship James Craig. 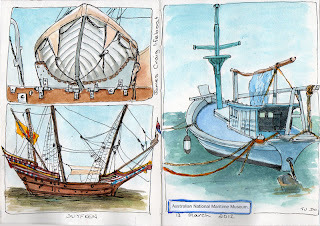 I've been before and even sailed on her, so while my friend did the tour, I drew a lifeboat. I then bravely drew the whole Duyfen (I've only done sections before - she is so ornate) though I couldn't fit her all in. Drawing so small is not my forte. The boat on the right is the Tu Do (freedom) which brought refugees to Australia in 1977. You can read the story here.